avast! Free Antivirus is a free antivirus, anti-spyware and anti-rootkit solution for non-commercial home use. It is designed for the average consumer who wants easy-to-use protection for basic email and web surfing. It scans for all forms of malware. avast! scans: On Demand - with Skinnable Simple Interface, during Boot Time and On Access. It protects E-mail, HTTP, NNTP, ICQ, mIRC, Kazaa etc. True low bandwidth incremental updates. ...... security. New features match top detection with increased efficiency. Computer memory requirements for the new antivirus and antispyware engine have been cut in half. Scanning is 40 percent faster, saving both time and computer resources. Complete rootkit protection includes real-time detection to ward off initial installation, on-demand scanning and boot-time scans. avast! Free Antivirus new version 6.0 has a new interface with easy-to-adjust settings, a context-sensitive help menu and graphs showing ongoing protection activities. Users can set the time and conditions for complete scans, with avast even waking up their computer from hibernation for midnight scans before putting it back to bed. Qweas is providing links to avast! 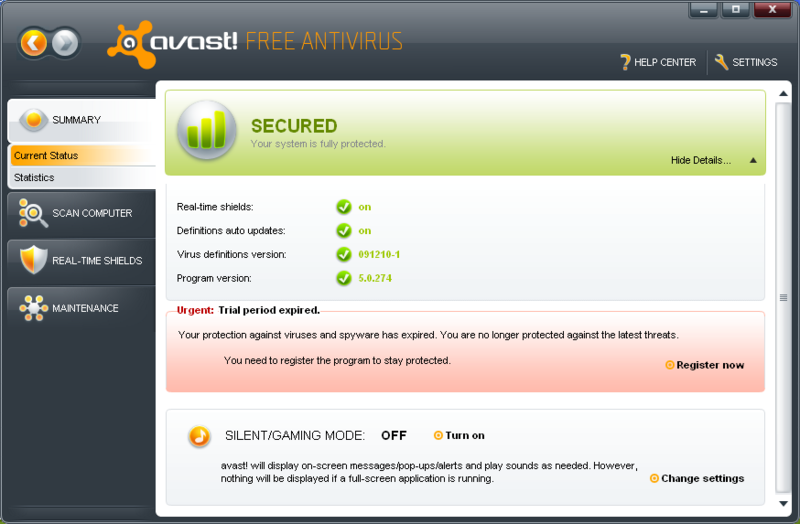 Free Antivirus 6.0.1367 as a courtesy, and makes no representations regarding avast! Free Antivirus or any other applications or any information related thereto. Any questions, complaints or claims regarding this application avast! Free Antivirus 6.0.1367 must be directed to the appropriate software vendor. You may click the publisher link of avast! Free Antivirus on the top of this page to get more details about the vendor.